Several hundred members of the Christchurch Muslim community gathered Wednesday to bury the first two victims of the recent mass shootings which killed 50 worshippers at two separate mosques and left dozens injured. In just the first of many burials in the days to come in the grieving city, male community members carried the bodies of father and son victims Khalid and Hamza Mustafa to the gravesite and then patiently lined up to throw handfuls of dirt into the grave. 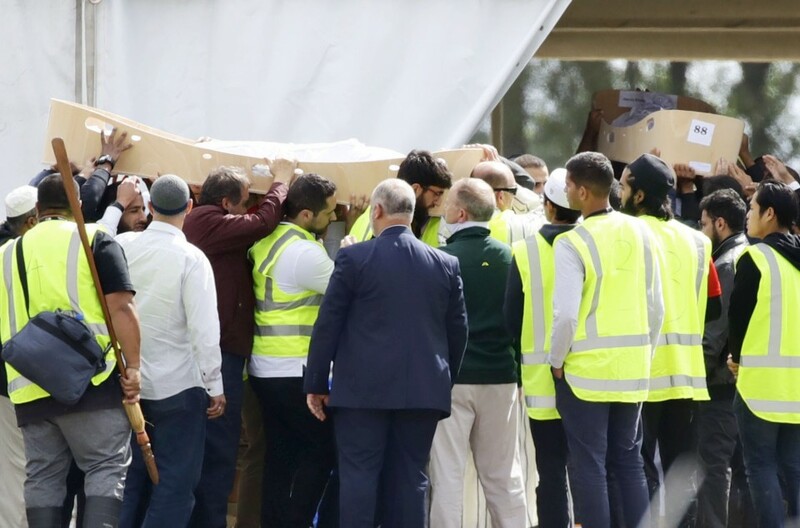 The 44-year-old and 15-year-old Syrian refugees were buried in the Muslim section of Memorial Park cemetery in the outer suburbs of Christchurch. 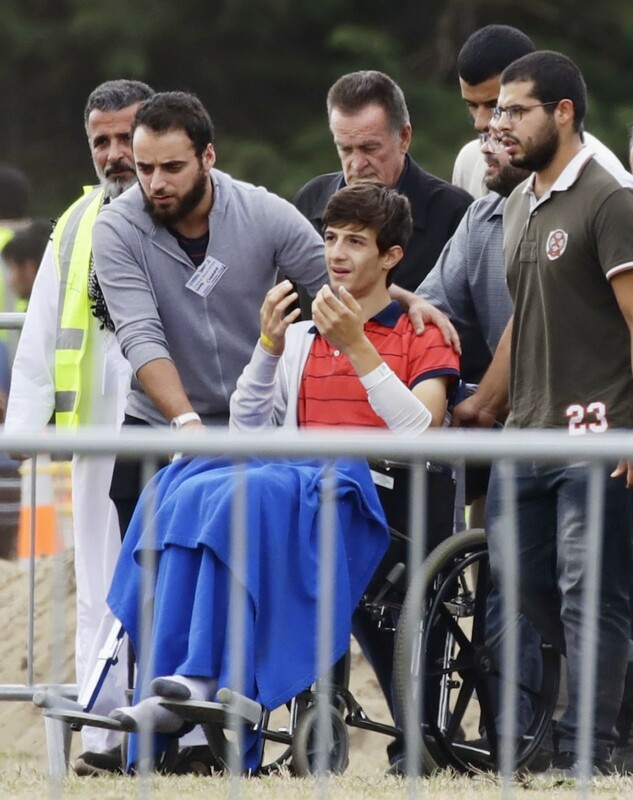 Mustafa's second son, Zaid, was badly injured in the attack but survived. The 13-year-old attended the funeral in a wheelchair, according to one of the funeral attendees. "It should be me with you. I want to be with you," Zaid said in front of his father's grave, according to Jamil El-Biza. The Mustafa family arrived in New Zealand just last year, and the victims are survived by Mustafa's wife and two other children, according to Syrian Solidarity New Zealand. "I cannot tell you how gutting it is to know that a family came here for safety and refuge (but died in this incident) and they should have been safe here," Prime Minister Jacinda Ardern said at a press conference in Christchurch later Wednesday. Mustafa and his son were among the 42 people shot dead inside the Al Noor Mosque, which at the time of the attack was filled with hundreds of worshippers gathered for midday prayers. After attacking the mosque near Hagley Park, accused gunman Brenton Tarrant then traveled 5 kilometers to Linwood Mosque on the other side of town, where he allegedly shot seven members of the congregation. After being hospitalized, another person later succumbed to injuries sustained in the shooting. Ardern said at the press conference that she recognized there is a great desire among Muslim and non-Muslim New Zealanders to come together this coming Friday and commemorate one week since the attack. "To acknowledge this, there will be a two-minute silence on Friday," she said, adding that the Muslim call to prayer will also be broadcast nationally over television and radio. Meanwhile, police said the gunman is believed to have been on his way to a third location when he was stopped by two police officers, 36 minutes after the shooting started. "We strongly believe we stopped him on the way to a further attack," Police Commissioner Mike Bush said at a separate press conference. "Lives were saved," he said, but declined to comment further. Returning to Christchurch for the first time since Saturday, Ardern earlier Wednesday visited Cashmere High School, which lost two students in the shooting, including 15-year-old Hamza. Ardern, who was greeted by students with a Maori haka, spent more than half of her 30 minutes at the school answering students' questions. "There will be a lot of questions that you might have and a lot of things that we need to do now, and I want to make sure I answer all of those questions, and that includes to young people like yourselves." Students were forthcoming in asking the prime minister a wide variety of questions, ranging from when a national memorial will take place, to how heightened security laws may affect who can enter the country. However, it was the very first question that touched teachers and journalists present the most: "How are you?" "Thank you for the question," Ardern said. "I'm very sad." The prime minister later elaborated on her response to the student's question, saying she fortifies herself in this difficult time by focusing on her duty of care to the country. "I have a role that I need to play. I need to hear the grief and I feel the grief but I also have a duty of care to the people involved in this to also keep going. So if the Imam who stood at the front of the mosque and saw firsthand the loss of his worshipers in front of him can keep going, then I definitely can." Ardern concluded her meeting with students by reiterating her request from Tuesday not to say the gunman's name. "Don't say his name. Don't dwell on who he is. Dwell on your students and your friends because they are the most important people we need to remember right now." Not including the deceased, around 50 people were treated for gunshot wounds and 30 remain in hospital, nine in a critical condition. The Australian-born Tarrant on Saturday appeared in the Christchurch District Court, where he was charged with one count of murder. Police have already said he will face further charges as investigations continue. On Monday, the New Zealand Herald reported that the accused will represent himself in court after he dismissed his court-assigned lawyer. Lawyer Richard Peters, who represented him at Saturday's preliminary hearing, said Tarrant may use the trial to publicize his own extremist beliefs. Tarrant remains remanded in custody until April 5.